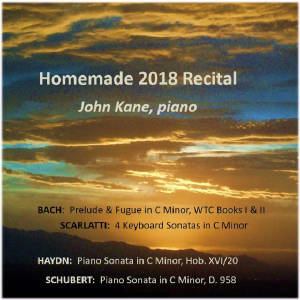 Homemade 2018 Recital includes Preludes & Fugues in C Minor, WTC, Books I & II by J.S. Bach, 4 Keyboard Sonatas by Domenico Scarlatti, Haydn's Piano Sonata in C Minor XVI/20 & Franz Schubert's Sonata in C Minor, D. 958. It is available as a full-length CD for $25+ S/H or individual tracks listed below can be purchased as MP3 downloads. Please click on track number below to hear a brief excerpt. Entire Website and Contents © 2019 Keynote Records. All Rights Reserved.